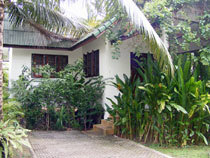 This beautiful, one bedroom bungalow is located in the North of the island Koh Samui in a quiet side road. 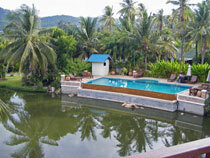 The bungalow is embedded in a lush, tropical garden which embraces a small lake. Beside this house here are a few smaller bungalows and a two story house with two apartments, a communal pool with parasols and sunbeds, and a Café/Restaurant open daily from 11am to 10pm. To the well-known Fishermen’s Village with its beautiful beach and many shops and restaurants it is just a 10 minute walk. A car park is close to the house. 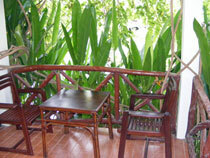 Escalating four steps you reach the roofed front terrace with a table and two chairs. Lush, tropical plants provide privacy on you terrace. Through sliding glass doors you enter the open plan living-kitchen area. 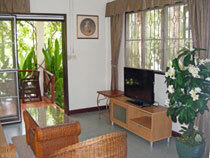 The living area is furnished with a table, a sofa, an armchair, a side board and a TV. The kitchen adjoins this area and is equipped with a counter, a two burner gas stove, a sink, a water cooker, a fridge and some pots and pans. 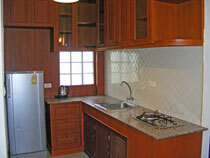 At the end of the kitchen is the bathroom with a shower, a wash basin and a toilet. Next to the kitchen is the entrance to the bedroom with a double bed, bedside tables with a lamp, an air conditioning, a dresser with a mirror, and a fitted wardrobe. 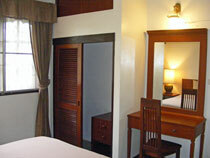 For long term rentals from 7 month on the tenant must bring his own linen and towels. 1x cleaning per month for 300,-THB is obligatory, additional cleaning also costs 300,-THB. For inquiries, please contact: wolfgang@samuihouserentals.com or use our contact form. Please name the house, Bophut 05, you are asking for, Thank You.